John’s Horror Corner: Grave Encounters (2011), a bad day to be a Ghost Hunter! I have to point this out. What a great tagline! They were searching for proof…they found it! MY CALL: This flick really surprised me. I’m so glad I took a chance on this one. Flicks like this and The Hazing (2004) inspire me to continue taking chances when Netflix or Amazon throws a weird suggestion my way. I give this a direct-to-DVD horror “A”. Watch it on Netflix (streaming). IF YOU LIKE THIS, WATCH: The Paranormal Activity films (2007, 2010, 2011), White Noise (2005) and Session 9 (2001). Also, The Last Exorcism (2010). This movie operates much like The Last Exorcism (2010). We follow Lance Preston and his Ghost Hunters film crew into a haunted mental hospital in search of the paranormal. It comes off as a satire, with a lot of sophomoric sarcasm and a totally fake medium. They laugh about things being “too over the top” between cuts and they pay a gardener twenty bucks to lie about seeing a ghost on the property. This works out fantastically! Normally the first 20-30 minutes of any horror are painful. They have barely-trained actors and a perfunctory storyline. 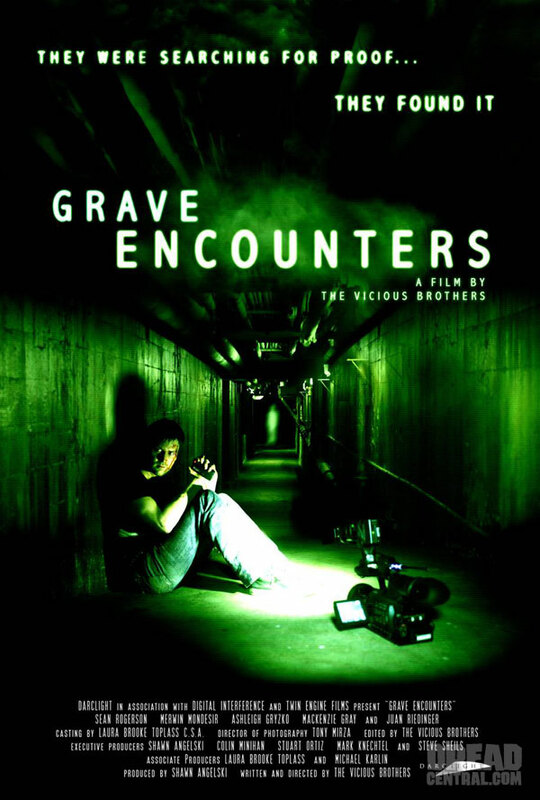 Grave Encounters, however, has good acting and draws a lot of smiles as we learn about the film crew. This also serves as a superior directorial device to engage the viewers into caring about these characters. The story is simple and certainly nothing new. The crew locks themselves into the abandoned hospital from 10pm-6am, giving them eight hours in total darkness to catch some paranormal activity on film. They get a tour from the caretaker and hear a few “real” ghost stories about the place to hype up their show (called Grave Encounters) and choose where to place static cameras. The execution is more like the Paranormal Activity films (2007, 2010, 2011). There’s a lot of slow tension build-up and you find yourself concentrating on the screen; staring waiting for something to move and listening for a subtle sound (like White Noise (2005)). This is a style that I love, but many people don’t like this. What caught me off guard is that while everything was done surprisingly well in terms of acting, effects, sets, scares, and directing, the writing seemed very misguided. Not the dialogue, but the events. At first things seem sensible. Some random objects move here and there. But as the movie progresses and the intensity of the paranormal activity amplifies, the events seem less connected. The writers mix elements of “ghost” movies with elements of “house” movies. In the movie, Lance explains that there are static and intelligent hauntings. Static haunting account for the “house” movie subgenre, in which there is an energy echoing a past event (but there is no specific ghost, demon or spirit). Intelligent hauntings are our “ghost” story subgenre, in which a paranormal entity has some motivation and responds to human presence. In most horror movies, the writing will choose one subgenre or the other. Really never both. Anyway, this subgenre combo doesn’t work. People start disappearing or dying and we don’t know why. Some weird things happen that make me want to guess “why this is happening” or “what the ghost wants” or “what happened in the hospital” or “are the crew members somehow linked to the hospital?” Ultimately, I was hit with a lot of red herrings which served no end. As a result, the end of the movie was simply when we ran out of people to kill or mysteriously disappear. I wanted a little more. Despite this big overall writing flaw, each individual scene worked well. I enjoyed every five minute piece of the movie. Some scenes actually utilized some really cool (all be they disconnected) ideas to add to the eerie atmosphere. But after the first 30 minutes, the scenes just failed to make a story when assembled chronologically. However critical I may sound, I really enjoyed this and strongly recommend it to any of you who enjoy occasionally taking a chance on an unknown direct-to-DVD horror. A closing sidebar. For those of you who enjoy “ghost” and “house” movies, keep an eye out for Haunter, which promises to be a “reverse haunting” perspective. I liked this a lot too, but it got very mixed reviews. There are certain scenes that really were original IMO. The scene with the bathtub and the scene when they finally get out the front door – only to learn they didn’t… They set it up like the TV show Ghost Adventures and the MC even acted like the shows host. Love the part when they pay the landscaper $20 to say he’s been seeing things! This was another film where I loved the direction/acting/production more than the writing. Although I did love the reality TV “set ups” as well, just like in The Last Exorcism. I agree with most of your horror rantgis and your conclusions and will thirstily look forward to your next updates. Just saying thanks will not just be enough, for the phenomenal clarity in your writing. I will right away grab your rss feed to stay informed of any updates. Authentic work and much success in your business enterprize! I will be following all of your tweets so I know when new content and podcasts are available. Our podcast has come a long way. Check out http://www.blogtalkradio.com/moviesfilmsandflix for live streaming. We are over 30 episodes now!